Speakers have a tendency to assume the worst about audiences. They think their listeners aren't really listening or won't pay attention, or will find them boring. But in my experience, people don't put themselves in seats before you if they don't expect to get something from you: Insight, new perspective, encouragement, and most of all, meaning. Public speaking may be the most visible indicator of humans' quest for making sense of the world around us, and audiences have meaning in their sights, even if they don't realize it. 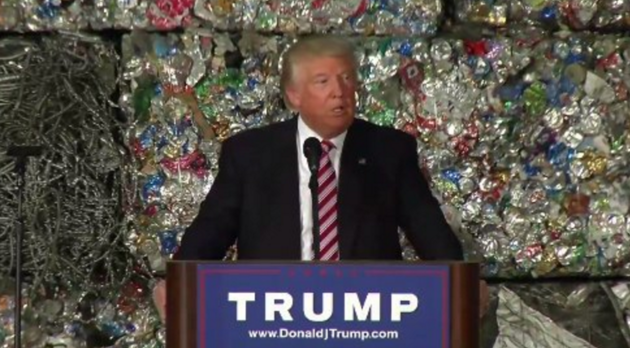 So it was no surprise to me that many observers, seeing Donald Trump give a speech on trade in fromt of what looked like a giant wall of trash, rushed to label it a metaphor. Some did that with a heavy dose of irony, some in utter innocent effort to make sense of the odd visual. But meaning--the thing at which metaphor excels--was being sought. 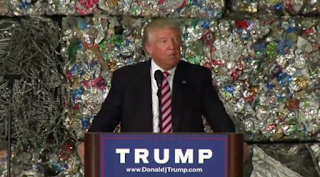 The reality was a tad more pedestrian, and typical of a campaign stop: Given at a company that compacts aluminum cans into cubes for recycling, the speech had a backdrop of the company's product. But that pretty much got lost in the commentary on Twitter and traditional media. Election cycles aside, it's a great example of how a metaphor can backfire--particularly when you weren't reaching for one in the first place. That's one reason you should test metaphors (and test for inadvertent metaphors) before you mount any event, campaign, or announcement. It's events just like this one that we'll be discussing in Edinburgh in October at my workshop, Add Meaning with Metaphor, a pre-conference session at the Speechwriters and Business Communicators Conference. We'll be talking about metaphoric wins and disasters, with lessons for you to heed and great ideas to steal when you're crafting your next speech. The day-long workshop will cover much more, expanding your understanding of metaphor, and you are encouraged to bring with you an existing speech that lacks metaphor to see how using metaphor would change it. We'll be meeting in the stunning setting of the Scottish Parliament, and there's a reception and tour of that space immediately following the workshop. Registration will continue until the conference sells out but our best discount ends August 1, so you know what to do. Register at the links above or below, for either the workshop or the workshop and conference, which is my favorite gathering of communicators. I look forward to hearing your examples of metaphoric disasters there!